The increase of SSL/TLS traffic indicates that organizations are more and more focused on safeguarding the integrity of the data that flows through their Internet-facing applications. However, the concurrent growth of malware hidden within that encrypted traffic is cause for concern. blind spots could lead to financial losses, data breaches, and damage to your corporate reputation. That’s why it’s essential to regain visibility into that encrypted traffic and allow your malware-scanning and prevention devices to protect your apps and your network. The most efficient way to get that visibility is by orchestrating your outbound SSL/TLS traffic. 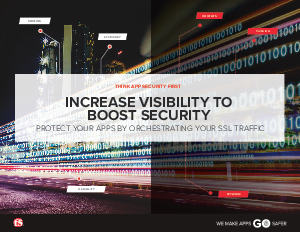 With a robust SSL/TLS orchestration solution, you’ll enjoy better visibility, increased performance, and more flexibility— so you can stop worrying about hidden malware and focus on developing and supporting new apps to drive your business.